More than half a century after forming arguably the first “rock super group” Cream, the power trio of Jack Bruce (bass guitar and vocals), Eric Clapton (lead guitar and vocals) and Ginger Baker (drums) released their debut album “Fresh Cream”(December 1966) the LP, which upon original release made #6 on the UK and #39 on the US album charts, receives the Super Deluxe Edition treatment thanks to compilation producers Bill Levenson and Mark Powell on Polydor Records, UK. The 3 CD/1 Blu Ray collection, includes the mono and stereo mixes of the album, the three related singles in their original mono mixes, rare French EP mono mixes, session recordings in mono and stereo that went unreleased at the time, early versions, outtakes and alternate versions, and BBC sessions from November 1966 thru January 1967, and the LPs’ US mono and stereo versions presented in 24/96 Hi-Resolution Audio, as well as six bonus tracks, half mono, half stereo, also in 24/96 Audio. 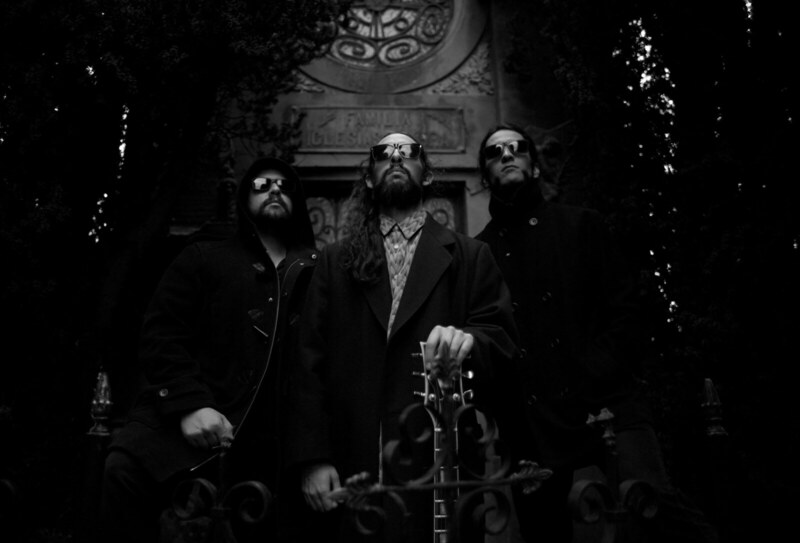 The band’s pedigree is not to be taken lightly. Jack Bruce came the long route, from the Graham Bond Organisation (where he and Baker came to know and strongly dislike each other) to Manfred Mann where he recorded the hit “Pretty Flamingo,” with a short stopover with John Mayall & The Bluesbreakers (during Clapton’s tenure in the band, but before the recording of the album that brought fame to both Mayall and Clapton). Eric Clapton came to the band directly from John Mayall & The Bluesbreakers, but not until recording the critically acclaimed, mythical album “The Bluesbreakers Featuring Eric Clapton” a #6 UK LP hit released earlier in 1966. Ginger Baker, as previously mentioned, came from the Graham Bond Organisation, and was a tough sell on the band as his dislike for Bruce would take much persuasion and on going peace making from Eric Clapton throughout the rather short, but prolific lifespan of Cream. From the album, (first presented in its mono version) opening track, the Jack Bruce/Peter Brown composition “N.S.U.” which was also the b-side of the band’s second single, the listener is aware that something special is in store, with Baker’s drums pounding, Clapton’s guitar soaring, Bruce’s bass booming, and Bruce’s vocals sounding ethereal. The song, which would have been a wonderful a-side, includes an inspiring solo by Clapton that roars over the tune’s incredibly catchy riff. The deceptively mellow “Sleepy Time” another Bruce/Brown tune is next up. A rather commercial number, Clapton’s guitar snakes throughout and Bruce’s gorgeous vocals are an added bonus. Clapton’s mid-tune solo is another amazing journey into Cream’s rock and roll repertoire. The amazingly appropriately titled “Dreaming” written by Bruce alone, is an incredibly melodic piece of music, showing the mellow side of Cream, and its versatility, including a most understated solo courtesy of Clapton. The Jack Bruce/Janet Godfrey tune “Sweet Wine” is a punchy rocker, with Baker’s drums pounding and Bruce’s vocals in perfect sync with Baker. The tune takes a sudden turn a bit over a minute in with Clapton adding a solo that takes the listener to and fro, and makes a rocker out of a seeming pop tune, with Baker taking a short, but quite tasteful drum solo. This tune is yet another potential single that was never released as such. Side one of the album closes with the band’s six minute plus cover of the Willie Dixon classic “Spoonful” which reminds the listener of the band’s blues foundation. The song was released as a two-sided single in September 1967, the third and final to accompany the album. This may well be the best known version of the often covered tune. Bruce’s vocals are grittily perfect as Baker pounds his Ludwig drum kit into submission, Clapton’s slow-handed guitar solo flows so smoothly joined by Bruce’s harmonica, before Clapton’s feedback and reverb fueled guitar pushes the beat into overdrive. A mid-tune tempo change lulls the listener into a false sense of relaxation, before Bruce’s screaming vocals, Clapton’s insistent riff and Baker’s pounding drums drive the tune to a close. A constant live favorite of the band, this studio paved the way. Side two opens with the traditional “Cat’s Squirrel” a hard driving rocker, featuring Clapton’s driving guitar riff, swirling round and round, before Bruce’s bluesy vocals and Clapton’s snaking lead guitar set the stage for another rock work out, which was also released as the b-side of the band’s October, 1966 debut single with the non-LP side, Bruce/Brown’s “Wrapping Paper” occupying the a-side. Next up is the Robert Johnson blues standard “Four Until Late” with Clapton taking lead vocals, Bruce contributing mouth harp, and the band switching to conventional blues mode. The Muddy Water’s “Rollin’ And Tumblin’” stays fairly close to the original with Cream adding a bit of pep and lots of enthusiasm. The band seems to really be enjoying themselves with their relaxed take, Jack Bruce’s vocals making it an ever so enjoyable experience. A raved up bit of blues rock, Cream obviously was having fun, at least for this brief space in time. A cover of Skip James’ blues standard “I’m So Glad” with its familiar intro by Clapton is probably the best known and most remembered tune from “Fresh Cream.” A relaxed take, Bruce’s vocal versatility is on display, with Clapton solo, restrained yet ever so explorative, swirling round and round, then firing to and fro. Another mid-tune tempo change with Baker’s drums holding the beat, gives way to Bruce’s insistent vocal refrain, with Baker exploring every piece of his kit, before an a capella section brings the tune to a close. The album closer, Ginger Baker’s “Toad” is a five minute, fifteen minute instrumental, which gives Cream to show their musical prowess. Clapton’s guitar soars, Baker’s bass booms, and Baker is a whirling dervish behind his kit, his drum solo coming in around the one minute mark and carrying the jazz tinged track for three and a half minutes, before Bruce and Clapton join in to bring the track and album to a close. The mono version of “The Coffee Song” a tune which did not make it through the album’s track selection, is a cover track, delivered in rather traditional blues style, featuring restrained guitar from Clapton, more gorgeous Bruce vocals, and an incredibly relaxed feel. 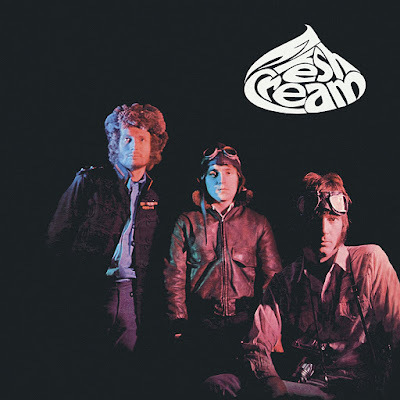 Perhaps a bit too commercial for the label or band’s decision in compiling “Fresh Cream” the tune is a most worthy effort, despite its almost demo like presentation. Next up are the group’s three singles related to the LP release. The debut single a-side “Wrapping Paper” is a mellow number, dominated by Bruce’s vocals, rather atypical of Cream’s catalog. A somewhat odd choice for a debut single, the track did crawl to #34 on the charts, but luckily was only the starting gate for the band. “Cat’s Squirrel” the single’s b-side is much more symbolic of the band, with Clapton’s guitar pushing this toe tapper, his mid-tune guitar break giving the song its texture before the song returns to its main riff, only to have Clapton’s solo come in around the two and a half minute mark, and drive the track home. The band’s sophomore 45, with the Bruce/Brown “I Feel Free” as its a-side is Cream at its best. Hand claps and Bruce’s vocal introduce the song, before the band jumps in and fires three minutes of classic blues rock to the listener. Clapton’s lead line soars and is enough to make one wonder why this song didn’t climb higher than the #11 position it did attain on the UK charts. A gorgeously haunting blues rock number, this song should have given Cream a #1 hit, but did break the ice, so to speak, regarding the charts. The single’s b-side “N.S.U.” as mentioned is an amazingly melodic rocker, Bruce’s gorgeous vocals soaring over Clapton’s stunning solo. This would have been a perfect a-side itself. The tempo changes are heart stopping and Cream shows they were a “no holds barred” band. The double sided “Spoonful” is next up, in edited form, with about two and a half minutes occupying each side. The single, which did not give Cream a hit still shows the band at their blues rock best. Disc one closes with two French EPs, each consisting of four tracks. 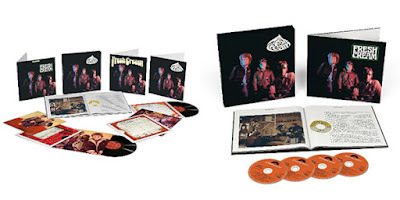 The tracks are of particular interest, as three, ”Wrapping Paper” “Sweet Wine” and “I Feel Free” appear in alternate mix forms, and two “Cat’s Squirrel” and “Rollin’ And Tumblin’” appear in alternate master version takes, both containing completely different guitar solos by Clapton, not found on any other release until this collection. In addition, “I’m So Glad” “N.S.U.” and “Four Until Late” appear in slightly different edits than appear elsewhere. Disc one comes in at a filled to the max 79 minute run time. Disc two opens with the UK stereo version of “Fresh Cream.” The run times vary slightly from the mono edits, and the sound is incredibly crisp considering the relative youth of stereo released rock albums in 1966. A wonderful release on its own, it serves as a great comparison piece to the mono release. Which is better? Beauty is in the ears of the beholder, but I somehow prefer the mono release. The albums ten tracks are followed by two session recordings, which saw mono single release, but are included here in stereo form, “I Feel Free” and “Wrapping Paper” as well as a stereo version of the session recording “The Coffee Song.” The disc is filled out with new stereo mixes, all previously released, of seven tracks “I’m So Glad” “N.S.U.” “Rollin’ And Tumblin’” “Spoonful” and “Toad” which made the LP, although “Rollin’ and Tumblin’” and “Spoonful” are presented here in their first versions as well as well as “Wrapping Paper” which saw mono single release, and the session recording “The Coffee Song.” The new mixes, done by Ben Wiseman and Mark Powell, sound amazing and are certainly welcome additions to the set. Disc two is most interesting and clocks in at a most respectable 74 minutes. Disc three opens with 11 early versions, outtakes and alternate mixes, all previously unreleased besides “You Make Me Feel Free” first released on the 1997 box set “Those Were The Days.” The takes, including three of “I Feel Free” are most interesting in showing the band at work in the studio creating “Fresh Cream.” Disc three is filled out with no less than 16 BBC recordings, the result of four sessions between November 1966 and September 1967. Of special interest are tracks not appearing on “Fresh Cream.” Two takes of “Steppin’ Out” are included, as is a short, but exciting run through of Robert Johnson’s “Crossroads” and a take on Jack Bruce’s “Traintime” both of which would appear on the 1968 double album “Wheel’s Of Fire.” Incredible to get early listens to songs that would not gain official release for such a long time, especially “Crossroads” which remained a staple of Cream’s live repertoire from their earliest days until their all too sudden and quick demise. The BBC takes are not terribly unlike the studio takes, but are certainly a welcome documentation of a great band and its ability to match their studio masterpieces in the BBC studios. Disc three, with 12 of its 27 tracks being previously unreleased has a run time of 73 minutes. Disc four presents both the mono and stereo versions of “Fresh Cream” in Blu Ray 24/96 High Resolution Audio. The sound is simply amazing. “Fresh Cream” could never have sounded this good before, and there is no disappointment here, none whatsoever. The album tracks are joined by mono and stereo bonus track takes of three songs “Spoonful” “Wrapping Paper” and “The Coffee Song.” It requires a Blu Ray player to hear this immaculate sound, but if you aren’t fortunate enough to own one yourself, take the set somewhere that gives you access. It is absolutely stunning. The Super Deluxe Edition of “Fresh Cream” has 98 tracks spread across its four discs, all sounding better than ever previously available. But, the set also contains a 64 page hardbound book, with an essay by David Fricke, lyrics to each and every track, original and cover tunes alike, tons of gorgeous color photos of the band, LP and 45 artwork and other memorabilia, a 1966-1967 tour schedule complete with posters, and photos of master tape boxes from the sessions. I’m not big on oversized, sprawling super deluxe editions, but “Fresh Cream” with its four discs in their own gatefold LP-replica case, and hardbound book both fitting nicely into a very sturdy heavy cardboard slip case is an exception. The set is available for about $45 US, a true bargain, and with the inclusion of the hardbound book and complete lyrics is just too good to be true. If you are a fan of Cream, 1960s mod rock, Eric Clapton, Jack Bruce or Ginger Baker, this set is an absolute must. 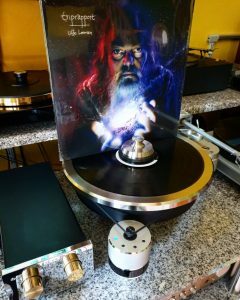 The mastering by Kevin Reeves is immaculate, with help from Ben Wiseman and Mark Powell in mixing and tape transfers from Paschal Byrne and Jared Hawkes. This is the perfect Christmas present for the music lover in your life and if you don’t have one of those treat yourself. This is absolutely too good to be true, so do not miss out while it is still in print. You have been forewarned. It's great another classic recording is featured. Thanks for sharing the review, this is another one to get.